One thing I love about climate fiction (cli-fi) is its fluidity. Its themes can twine through any other style of narrative, subtle as a spring zephyr or as consuming as a hurricane gale. 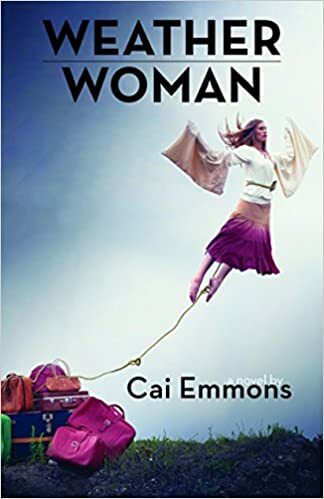 Cai Emmons’ new book Weather Woman unleashes it in a context I hadn’t encountered before. A heroine facing a personal crisis between her career struggles and a broken engagement sounds like pink-spine chick lit…until you add superpowers. Weather Woman reads like a superhero origin story with lyrical prose. Meteorologist Bronwyn Artair discovers she can do more than just predict the weather; she can control it. Polarized reactions of doubt and sensationalism ensue as Bronwyn tries to use her newfound power to combat climate-change disasters threatening human lives. Emmons has an elegant touch with words. Few authors send me to the dictionary every few chapters (Margaret Atwood and Adrian Tchaikovsky are the only ones to do so recently), but Emmons taught me a few new terms. The style becomes almost self-consciously literary at a few points, like she was trying a little too hard for invention. Images like “the pelvic floor of summer” are certainly memorable, but not in a good way. Overall, though, the lush prose is the novel’s strongest aspect. For the first half of Weather Woman, the lovely writing alone kept me turning pages. By the time I reached the midpoint, however, I was craving more story. A thick fog bank of authorial narration makes the third-person perspective feel far removed; I never engaged with any of the characters, who undergo only perfunctory and predictable development. Scores of characters who exist only as plot conveniences and exhibit no arcs of their own add to the diorama feeling. The romantic subplot was the “instalove” variety I revile. Guy meets girl for fifteen minutes and is suddenly so captivated that quits his job and follows her across the country? That’s not love, that’s stalking. Then there’s the missing stakes. Bronwyn never demonstrated the consuming motivation I look for in a protagonist, only a tepid altruism without much personal investment. Nor were there dire risks to her inaction, other than colleagues scoffing at her or weather event continuing to impact communities. The low tension made it implausible when, near the end, the stakes skyrocket to the point of literally saving the world. Without escalating tension throughout, this feels forced. I’ve never met a reader who stayed up past their bedtime because they couldn’t disengage from a book’s beautiful language. They want a compelling story, the breathless hook of “what happens next?” For me, Weather Woman’s flimsy narrative structure ultimately can’t support the weight of its ambitious themes or prose. Despite these critiques, I appreciate that Emmons attempted an unconventional approach to cli-fi. Dystopian stories about the weather abound on bookshelves and in the news, so styling the concept as a personal journey rather than a survivalist one is a bold effort. I can see Weather Woman as a positive “gateway novel” for fans of chick lit and literary fiction who might normally hesitate to try speculative tales. And with Earth’s environmental situation darkening by the day, the call for action needs to reach the widest possible audience.